This exotic batik print hails from India. 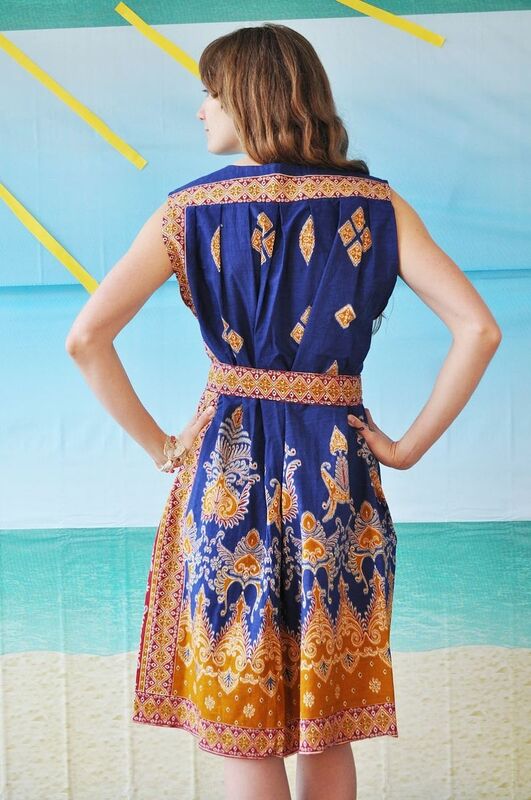 The border print of paisleys suits the lines of this wrap dress perfectly. The front has a beautiful red and gold theme while the back is in blue. 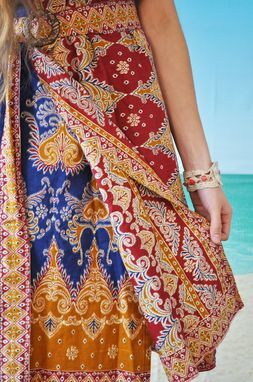 An advantage of using batik-printed fabric is that the inside of the dress is just as colorful as the outside. 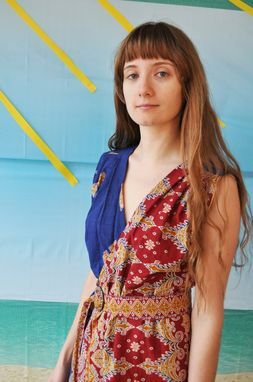 This is true wrap dress, so the front hem may flap in the breeze a bit. The yoke at the top catches generous pleats which fall to just below knee-length. A coordinating fabric belt with a coconut shell buckle cinches the loose folds around your waist. This belt is the only fastener. The result is comfortable, flattering and slightly flirty when a breeze catches the open end. 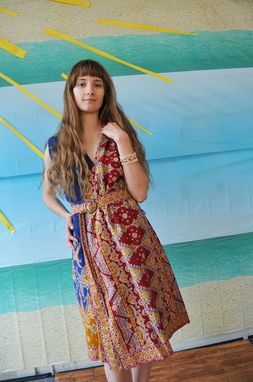 I found just enough of this fabric to make one, unique dress. You'll never need to worry about wearing the same outfit as someone else! All the materials in this dress are upcycled. Because of its construction the dress is fairly adjustable. The length of the dress measured from the back of the neck is 38" and the width of the shoulders at the back is 15". The belt is a generous 54" long. I've listed ranges of measurements that the dress would fit.